Remember that HGTV show Design On A Dime? I think it was my first favorite home improvement-type show. 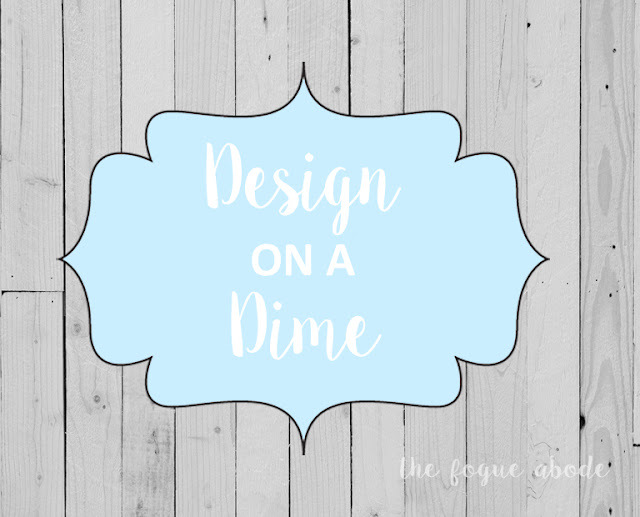 I loved how they would update a space on a budget….well, their budget which was quite a bit higher than my type of budget, but you get the idea. I wanted to start a series with you guys on how to update a space on a dime budget. 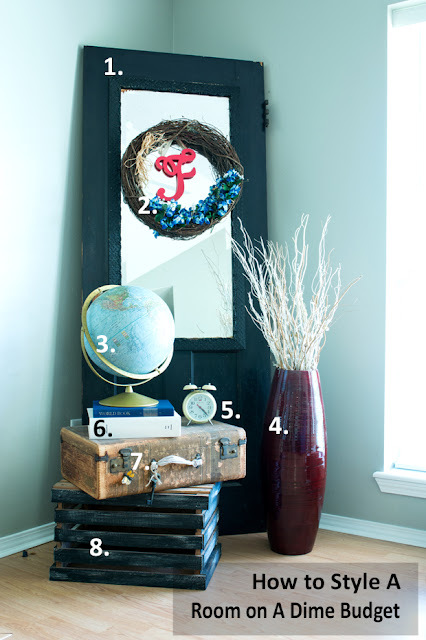 I’m all about thrifty ways to decorate or repurpose an item you have laying around the house. Today, I want to showcase the awkward corner in our formal living room. I’m sure you have seen the updated version here and there, but I haven’t actually showcased it and told you how I styled it to be a cool focal point in our living room. Here is the most recent shot of my flea market corner. I like to change out the pieces quite regularly to keep an updated and fresh look. Lately I’ve been obsessing with globes and alarm clocks, so they get to be featured here. How did we get the look? This large door with mirror was probably my biggest splurge in this corner. But, I knew it would be the signature piece; therefore, I was willing to spend a little extra on it. This was a $100 find at Amity Trade Days. You could easily find a cheaper door or even a free door if you can find an old abandoned building and the owners are willing to let you salvage. This $5 wreath was another Amity Trade Days find. I love a good wreath to accent any door. We added the little red F that was a Christmas tree ornament. The Globe…all the heart googly eyes! I have been obsessing with globes lately. When I mentioned it to my mom, she said she had my great grandmother’s globe that was just collecting dust and I could have it. Score. It’s so fun and special to use family heirlooms as your décor pieces. I have many around my house. I really needed something to balance out the other side of this stack and was eyeballing this large vase from Amazon. It was a little more than what I was willing to spend at the moment, so I asked for it as a gift for Christmas. Gifts are great ways to add decorative items to your home that you aren’t necessarily willing to fork out cash for. I added these twigs that were used in our wedding decorations. The alarm clock, another heart-googly-eyes item! I picked him up at a local flea market for just $6. A stack of books are always a fun way to elevate items and give some dimension to a look. Here I used a local reference book which was also a great-grandmother find, and an F Encyclopedia. During a local blog meet up this weekend we were discussing having to explain to our kids what an encyclopedia was. That gave me the fun idea to include it in our home. That way I can show A this ancient treasure when she grows up. 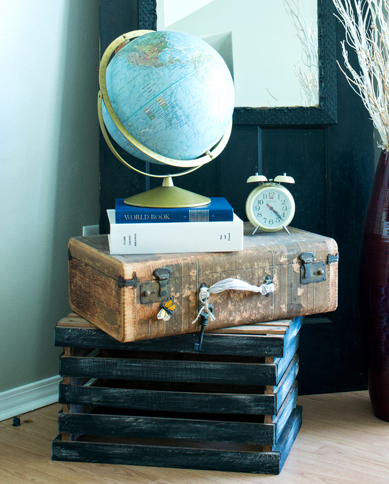 A good suite case is always a cute and vintage piece to use to decorate your house. You can find them every where. Check out a yard sale or flea market for a cheap find. Finally, I used the crate to start the stack. Crates/Baskets are essentials in our home. They are easy to change up and can be used in a multitude of manners. What cool items are you decorating with these days? « Gettin’ Groutt-y With It! I have also recently discovered that I love flea market shopping! We spent almost everyday on our last vacation at flea markets! We can't wait to go back to check more out that we didn't have time for! Also I love all you home decorating ideas! Aw, thanks! If you haven't been to The Painted Tree in Bryant, I recommend it. That one is my favorite.